Last summer the Pakistani Army ordered the evacuation of Miram Shah, a town in the heart of North Waziristan, and all the villages surrounding it. Nine-year-old Sarah had lived in North Waziristan her entire life, but she was happy to leave. Every time a Pakistani Army jet or a US drone flew too close, her family had to race to the bomb shelter, which her younger siblings had turned into a game. But Sarah hated being in the dark hole as much as the noise of the bombing. Her father tried to reassure her, telling her the attacks were meant for the militants—the Pakistani Taliban—not her. Then, five days after the military launched a major offensive to root out militants from the region, Sarah and her family received the notice of evacuation. All residents surrounding the towns of Miram Shah, Mir Ali, Datta Khel, and others were given three days to leave, after which all roads leading out of North Waziristan would be closed. Anyone who stayed behind would be considered hostile to the state, said the evacuation notice. For more than a decade, families like Sarah’s in this region bordering Afghanistan have been stuck between two terrifying forces: the Pakistani military and the militants, the Tehreek-e-Taliban Pakistan (TTP), colloquially known as the Pakistani Taliban. During the Cold War, the CIA and its Pakistani counterpart, Inter-Services Intelligence (ISI), convinced many of the tribesmen to join the war against Soviet forces then occupying Afghanistan. Then known as jihadis or mujahedeen, they were even celebrated as “freedom fighters” by President Ronald Reagan when he hosted some of their leaders in the Oval Office in 1985. But after the Soviet Union left Afghanistan, the Americans also abandoned it, leaving behind a power vacuum. Civil war raged until the Taliban, a disciplined Islamist fighting force trained and armed by the Pakistani military and ISI, took over Kabul in 1996. The Afghan Taliban harbored Al Qaeda fighters from Central Asia, Africa, and Arab countries until, after the terror attacks against the United States in 2001, the Americans invaded Afghanistan and drove those fighters across the porous border into Pakistan’s Federally Administered Tribal Areas (FATA), which include North and South Waziristan. The state-set historical precedent of jihad, the Taliban’s intimidation of the local population, and the lack of development and infrastructure in the tribal areas made it fairly simple for TTP fighters to take control of much of the region. Since 2004, the Pakistani Army has launched repeated operations against militants in the FATA. The United States has supported each offensive, because jihadi groups flourishing in the FATA have spread chaos in the region and pose a security threat to the West. Each time, it has been the civilians who paid the highest price. This operation was no different. Sarah’s father rented a wagon to transport his family to Bannu, a city three hours away by car. The journey, however, took them over 20 hours because arbitrary army bombings and the evacuation notices had created a panic, with 79,000 people fleeing the fighting. Those who could afford it traveled on wagons, trucks, cars, and coasters. Those who could not braved the journey on foot, despite the 100-degree weather. Sarah told me about her classmate, Noor, whose family had walked for three days. On the way, Noor lost two siblings to dehydration. Her father buried his toddlers by the side of the road before leading his remaining family to Bannu. Although just 30-odd miles from North Waziristan, Bannu is vastly different because it falls under the ambit of Pakistan’s courts and legal systems. Unlike North Waziristan and the other six tribal agencies that comprise FATA, Bannu is not governed by the Frontier Crimes Regulation (FCR), a set of colonial laws that the British imposed in 1901 to keep the Pashtuns, the dominant ethnicity in FATA, subjugated. The FCR bans political parties; it denies citizens of FATA the right to present evidence, hire legal representation, and appeal a verdict in legal cases; and its clause about collective punishment allows an entire tribe to be sentenced for an offense committed by an individual. In 2011, a presidential order was enacted to amend some FCR laws, but these revisions were never implemented. In addition to this political and legal discrimination, Pakistan allocates meager development funds to North Waziristan. It should come as no surprise, then, that interactions between civilians, such as Sarah’s family, and the state are often tense. “Near Bannu, a soldier searching our wagon for hidden weapons taunted my husband and called him a terrorist,” said Nadia, Sarah’s mother. Others also complained about mistreatment by the army during the evacuation process. On the other hand, even until July, soldiers in Bannu could be seen working into the night to prepare relief packages for the 1 million displaced people. The army and NGOs filled in the gaps that marked the government’s inefficient distribution. But Nadia found it difficult to trust the state. When the TTP and other extremist groups began gaining power in North Waziristan, the government first looked the other way. After failed military campaigns against the militants, the army signed peace deals with them. When the Pakistani Taliban broke those agreements and carried out deadly attacks across Pakistan, the state blamed the villagers for providing refuge to the Taliban. Under the collective punishment clause, villages were punished for harboring militants. “On one side the Taliban were slaughtering our tribesmen; on the other side the soldiers indiscriminately bombed our villages from behind their watchtowers,” said Nadia. A month after their displacement last summer, Nadia’s family was happy to be away from militant attacks, military bombs, and American drones, despite living in a single cramped room in Bannu. They wanted to go home only if the government would promise them peace. I first visited the displaced Waziris in Bannu last July, a month after Operation Zarb-e-Azb (named after the sword of the Prophet Muhammed) began. Then the press had been under pressure from the army to support the operation. Mainstream publications applauded the offensive, describing it as the inevitable way to restore the state’s writ in the region and calling it a response to the Taliban’s June attack on Karachi’s international airport, which cost 23 lives. Anyone against the operation was labeled a Taliban apologist. For more than five years, Washington had unsuccessfully been demanding that Pakistan clean up North Waziristan. During his May 2014 visit to Islamabad, US Deputy Secretary of State William Burns asked Pakistan to destroy terrorist sanctuaries there before the installation of a new government in neighboring Kabul. This new operation represented a shift in state policy. Six months and 2,000 dead alleged militants later, the second time I visited Bannu, the ongoing operation and the 1 million displaced people were mostly forgotten. “Now and then a bomb blast will drag a journalist to the city, or an aid worker will come to distribute books among the children,” said Nizam Khan, the founder of an NGO that caters to Waziri people. “But the country has forgotten us the way they forgot the 80,000 people displaced due to the 2009 military operation in South Waziristan.” Six years later, some of those displaced from South Waziristan still don’t have the means or the will to return. Khan, who is in his 40s, first got into trouble with the Taliban in 2007. He told a young Taliban recruit that death from a suicide operation wouldn’t grant him 70 virgin girls in heaven. Within hours, a militant commander summoned him. His education, wealth, and charm secured Khan a pardon, with a warning to mend his un-Islamic ways. Fearing for his safety, his mother begged him to flee the country. He did, but he returned in 2009, staying away from North Waziristan but maintaining ties with international NGOs and journalists, brushing aside warnings that these relationships could prove dangerous. Last July, two days before my initial visit, Khan narrowly escaped a bomb attack outside a building he regularly visits. The Taliban telephoned him and warned that if he didn’t revert to the Taliban’s path of Islam, the next bomb would be better placed. Long before the Pakistani Taliban emerged, the CIA and the ISI had similarly used Islam to turn the Waziri tribesmen against the Soviet Union. “We fought because we were told that Russians were infidels who wanted to eradicate Islam and Pashtuns from Afghanistan,” said Khan. “Many residents welcomed these Taliban, mujahedeen, freedom fighters and jihadists. In FATA, where people have been kept uneducated for decades, even mountains can be moved in the name of Islam.” By using religion to dupe the people of North Waziristan, the militants had recycled the ISI and CIA’s methods from the 1980s. Moreover, Khan said, when a militant group faced resistance, its members used violence to coerce civilians into providing them refuge. Like scores of other Waziris, Nisar has had several close brushes with death: During his election campaign, a gathering to canvass support for him was bombed. Six of his supporters were killed. “The blast scared me, but it did not surprise me,” said Nisar. The Taliban are against democratic elections, and bombings are one of their many scare tactics. The Pakistani Taliban also spread fear in North Waziristan through kidnappings and beheadings. Speaking against the Taliban, disobeying their orders, and interacting with the army can result in your decapitated body being found in the marketplace, with a damning letter beside it. In the past decade, there were periods during which he would come across two to three headless bodies a day, Nisar said. The letters branded the dead as US, Indian, or Israeli spies; the effect was to sow fear and distrust between families and tribes. Later that day, at an intimate musical gathering for journalists and aid workers visiting Bannu, an aid worker convinced a villager famous for his bravery against the Taliban to talk about his meeting with Hafiz Gul Bahadur, the TTP commander in charge of North Waziristan. The villager told his story under the condition that our recording devices be turned off. He abruptly paused whenever one of us so much as touched our cameras. The TTP’s takeover of North Waziristan was a mediated process. It was backed by ambiguous and constantly shifting levels of army and ISI support, said Umar Daraz, a Waziri reporter for a Prague-based news service. In July 2014, in a small hotel in Bannu, Umar and I discussed if it was possible to draw a sharp distinction between a civilian and a militant. It cannot be disputed that civilians gave aid and lodging to Taliban militants and helped them acquire goods. Some married their daughters to local and foreign militants. But, Umar said, the context for these relations was never acknowledged. Even as civilians in North Waziristan were being killed, the army was signing peace deals with the militants. In January 2014, when the TTP was accepting responsibility for bombings across Pakistan, Prime Minister Nawaz Sharif told Parliament that “we want to forget the unpleasant past and give another chance to peace talks,” with the TTP. If the army and the government have been unable to outsmart the militants, if US intelligence and drones have been unsuccessful in curbing them, he asked, then how can an ordinary civilian be expected to defy them? Such abductions raise suspicions that the intelligence agencies are colluding in the Taliban takeover of North Waziristan. Pakistani attitudes toward FATA and the Taliban remain confused, and vary depending on where people fall along the political spectrum. The left maintains that the conflict will continue until the state stops treating FATA as a colonial subject. Liberals blame the “fanatically religious” tribal populations and the state’s inability, or unwillingness, to educate them. Conservatives fault US imperialism and support the Taliban in what they insist is a “legitimate battle against the West.” Waziri demands are more consistent. Shazia is a 43-year-old Waziri woman who seemingly sympathizes with the Pakistani Taliban. Despite the logistical support she provided the militants, her demands from the state are the same as those made by Taliban opponents: They include education, police stations, courts, peace, and development. To achieve this, replacing the antiquated FCR with Pakistan’s legal system is crucial. In Bannu, Shazia could not afford rent for housing. The Pakistani Taliban had issued warnings to the Waziris against living in the army’s camp for displaced people. Those who chose the camps complained about snakes, scorpions, and a lack of privacy for the women. Like Shazia’s, hundreds of families camped out in government-run schools. As a result of living in the school, her children were attending classes every day. This had not been an option in North Waziristan. Even before the Taliban militants arrived, there had been no girls’ schools near Shazia’s village. A boy’s school existed, but it had been years since a teacher had set foot in it. Shazia had the option of educating them in religious seminaries, but she was not interested in raising clerics. She wanted her children to become doctors or government officers. Like Shazia, other Taliban supporters told me the Taliban cannot be blamed for all the sociopolitical problems of North Waziristan. “If the government had provided us with schools and jobs, the Pakistani Taliban would not even exist today,” said Shazia. Her husband agreed. Many of his brothers joined local militant groups because they were unemployed. He had not, because if he died in a battle, there would be no one to feed his family. I pointed out that by harboring militants he was inviting death by drone strike or army bombs. In those cases, he said, there would be no family left to feed. In the schoolyard the displaced children were playing the Waziri version of cops and robbers: Taliban vs. army. Both sides were armed with stick-guns. Shazia’s son explained the rules: to win you must stay alive. “There are no hospitals for the injured soldiers and no police stations for the captured militants,” said the boy, explaining his rules. The children were starkly aware of the lack of development in the tribal areas. The people of North Waziristan are not against the construction of markets, roads, hospitals, police stations, and courts. From Khan, who openly defies the Taliban, to Shazia, who fed them for a small payment, the residents of the agency collectively demand education for their children. The tribesmen are willing to enter a dialogue about the gradual replacement of the FCR laws with the federal and provincial courts, provided their jirgas are allowed to function as well. Why then, in the 60-odd years since independence, has no civilian or military leadership attempted to replace, or even amend, the FCR and provide basic infrastructure in FATA? Zaheeruddin Babar, the assistant political agent of North Waziristan, said that the answer lay in basic economic theory. Investment is most profitable in areas with the highest returns. “A school in densely populated Lahore educates thousands, but a school in Miram Shah will only affect hundreds,” he said. In an ideal world, distribution of economic resources would be fair and the lion wouldn’t eat others’ shares, offered Babar as I left his temporary office in Bannu, which before the operation used to house the provincial wildlife department. The process for the return of the displaced people began this past March, but Sarah and her family will not be going back just yet. 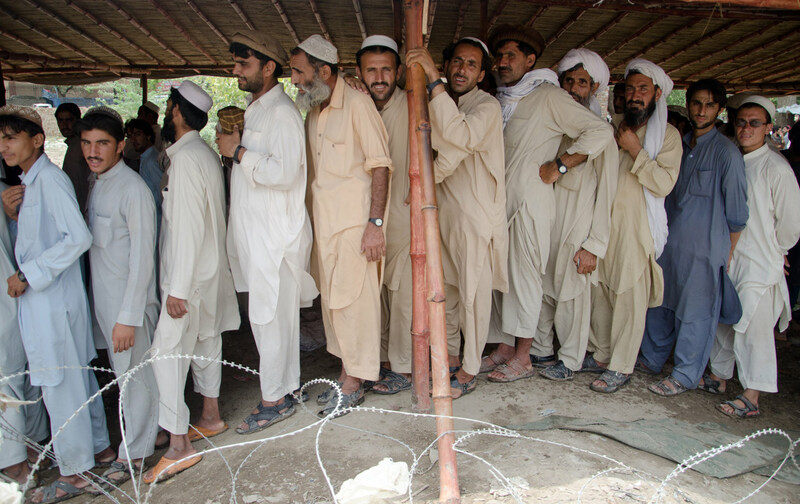 To return, refugees must sign an eight-page document titled Social Agreement North Waziristan 2015. The document asks that the tribesmen reaffirm their allegiance to Pakistan and the FCR laws. The document also holds civilians responsible for preventing enemies of the state, as well as local and foreign terrorists, from using tribal soil against the country. One tribesman’s failure to fulfill these responsibilities allows the government to cancel the entire clan’s national identity cards and confiscate or demolish their properties. In setting these conditions, the Pakistani government is taking a dangerously backward step, reimposing all the conditions that led to instability and insurgency in the first place. If the state cannot take responsibility for the security of North Waziristan’s citizens, then what did the recent military operation achieve? Displacing over a million people, only to revert back to the same colonial laws that allowed militancy to prosper, seems futile. From the perspective of the state, however, the document serves to prove that militants gained power in North Waziristan because tribesmen cooperated with them. Hence, it absolves the state of all blame. The document is a trick, said Sarah’s father to me over the telephone this spring. “When the army, Pakistan’s paramilitary forces, and the US can’t destroy the Taliban, then how can civilians be expected to resist them?” he asked. Hundreds others, including families like Shazia’s, have signed the document and returned home. But Sarah’s father is adamant that he will stay in Bannu until the FCR is replaced with police stations and courts, and schools and hospitals are rebuilt and housed with staff. It may be that Sarah and her family will never return to North Waziristan. Maham JavaidMaham Javaid is an independent journalist focusing on politics surrounding ethnic, religious, and gender discrimination. Her reporting has appeared in Foreign Policy, Al Jazeera, Women's eNews, and the Herald (Pakistan). She holds a masters degree in Near Eastern Studies from NYU.